Fertilisers play an essential role in modern farming and with the continued increase in input costs isn’t it time you considered using our products. We have a unique range of fertiliser products which allow us to work with you to supply products best matching the nutrient requirements of your crops. If you farm in (or near to) any of these delivery areas then why not get in touch? You can contact us either via our contact page or on the telephone number above. There are many benefits from the use of bio-fertilisers and biosolids and our simple fixed price solutions makes it easy to calculate your fertiliser bills for future years removing the headache of fluctuating chemical fertiliser prices. To find out more about any of our products or services please click on the factsheets below or speak to one of our team about your requirements. Biosolids is made in numerous plants across the UK and is rapidly gaining a place as a must have alternative fertiliser for many crops. This offers lots of Phosphate and is a great source of slow releasing Nitrogen which will feed your crops throughout the growing season. There’s also many trace elements and of course its packed full of valuable organic matter which is great for improving the condition of your soils. This is a solid fertiliser in the form of a cake which we deliver to the field using our fleet of trucks and tractor/trailers where we can stockpile it until you’re ready to use it – much like your own muckheaps! Standard Biosolids is suitable for use on arable and non-grazed crops. Target Crops: Cereals, Maize, Silage/Hay/Haylage. 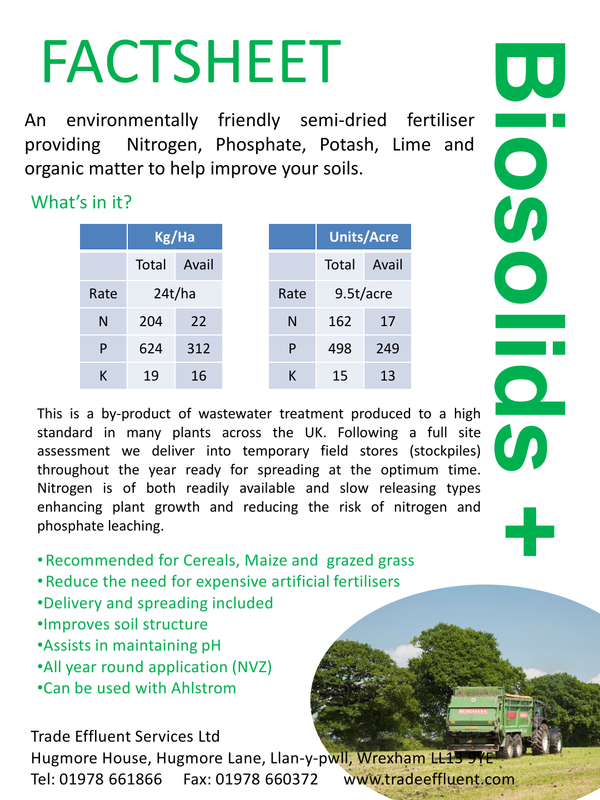 Biosolids+ is similar to the standard Biosolids fertiliser but has been through an extra treatment process making it suitable for use on your grazing ground. This additional treatment is either from a heat treatment process or in some cases the addition of Lime. Again this offers lots of Phosphate and is a great source of slow releasing Nitrogen which will feed your crops throughout the growing season. There’s also many trace elements and of course it’s packed full of valuable organic matter which is great for improving the condition of your soils. This is a solid fertiliser in the form of a cake which we deliver to the field using our fleet of trucks and tractor/trailers where we can stockpile it until you’re ready to use it – much like your own muckheaps! Biosolids+ is suitable for use on arable, grass and grazed crops. Target Crops: Cereals, Maize, Grazed Grass, Silage/Hay/Haylage. 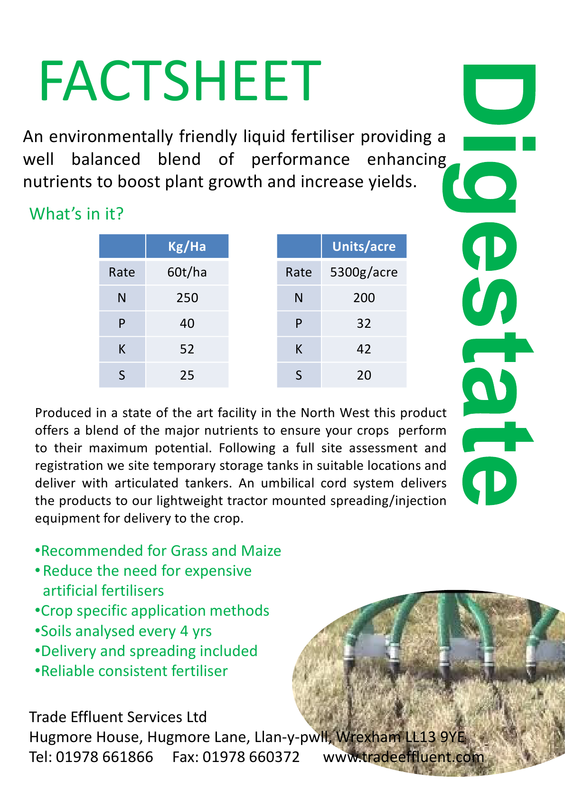 Digestate is a well balanced liquid fertiliser with highly available nutrient levels. This is great for grassland and is best used immediately following silage operations to give a fresh grass a flying start. For cereals incorporate a partial application into the seedbed and apply again in early spring to the growing crop. For Maize crops incorporate into the seedbed prior to sowing. 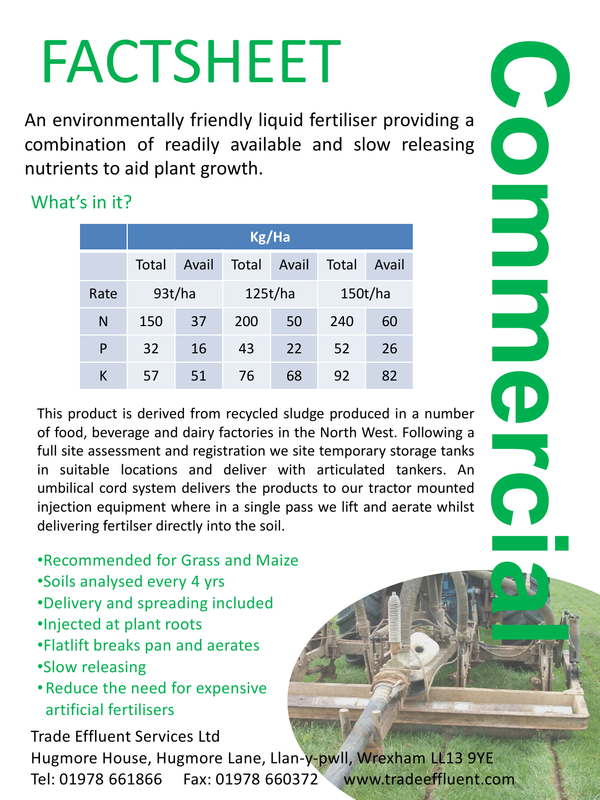 Commercial is a liquid fertiliser which we blend in our tanks to provide you with a balanced nutrient mix. Delivered into the field by umbilical cord system and applied using a direct injection method we place this under the ground below the plant roots. The Nitrogen is in slow releasing form and so the crops benefit over time as this slowly becomes more available to them. In a single pass we flatlift and fertilise your land breaking compaction and aerating as we go. 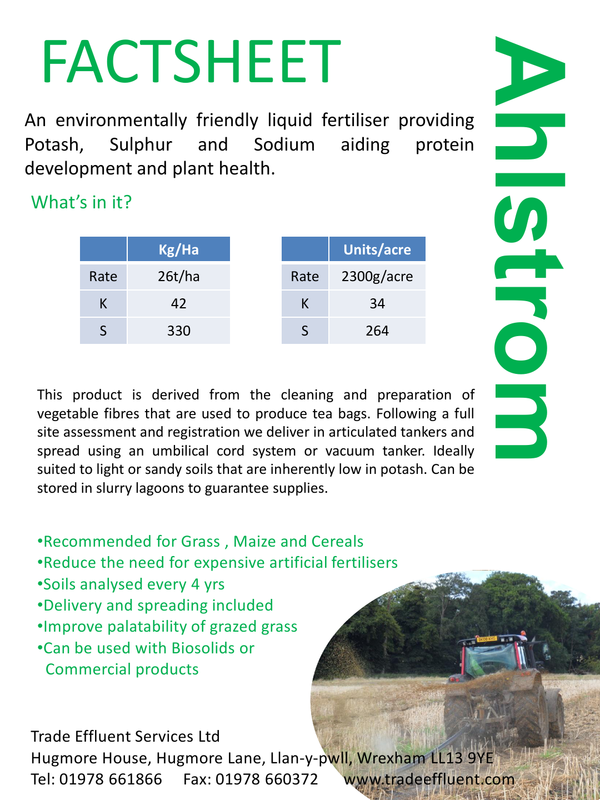 Ahlstrom is our low Nitrogen high Potash, Sulphur and Sodium liquid fertiliser. Great for maize, cereals and grassland alike it comes on tankers and we use an umbilical cord system to apply to your land. A more subtle fertiliser with essential nutrients to ensure that the plants can perform to it’s maximum potential. Where used on grass the sodium will increase the palatability of the grass and could also help to reduce staggers.